The swing turnstile is access control gate that used for people access. Compared with the flap turnstile, the swing turnstile can be a wider channel. So it enables access of luggage, handicapped, bicycle and trolley access control as well as free emergency evacuation. So it is mostly used as an addition to installing besides tripod turnstiles in order to ensure emergency evacuation. Though the swing turnstile gate varies in shape and some functionality, they all swing to open and are used to control access. 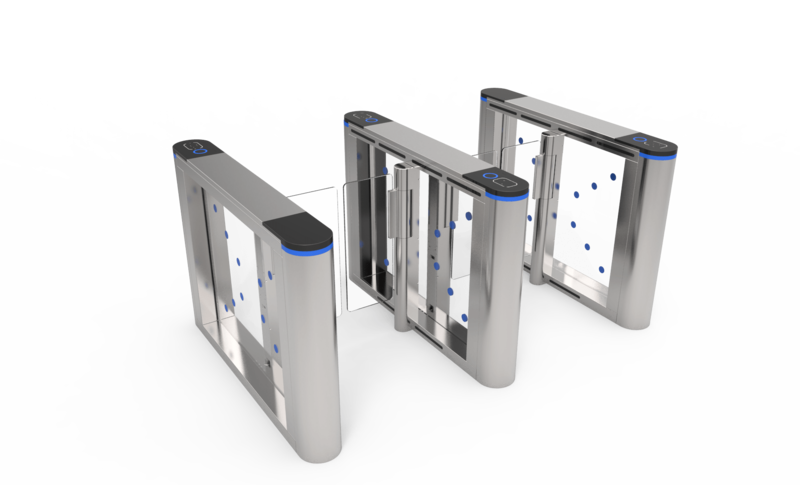 Same as other types of the turnstile gate, it can also be compatible with any access control system like RFID card system, fingerprint system, facial recognition system, barcode system, etc as well as manual button and remote control system. All of these gates can be configured for one-way or bi-directional access. Turnstile security swing barrier can often be used in most places where regular access control is needed, like in bank, fitness center, office building, school, cafe, warehouses, and metro station, etc. The fence swing barrier is widely used for supermarket entrance. We can also customize a movable plate with the wheel at the bottom. So the gates can be portable. This is widely used for events or for rent. Optional various working modes provide a one-way passing, two-way passing, infra-red opening or controlling passing through giving a signal to the main board (need another control system，Entrance guard， Fingerprint, etc. ), etc., all can be set through the main board. 6pairs standalone IR sensors ports on the controller, easy for troubleshooting and replace. One direction or bi-direction control is optional. Size and shape can be customized.